In episode 42, Rosie and Jessica have just returned from Fairport’s Cropredy Convention, where they placed equal importance on the music and the snack foods available. Rosie has made a triumphant return to the BFI, Jessica has made most of a triumphant pair of welly socks. This episode contains the silliest post-credit sting yet. Jessica has been plaguing Rosie with Marillion’s Kayleigh and Rosie has in no way annoyed anyone with Chas & Dave’s Gertcha. 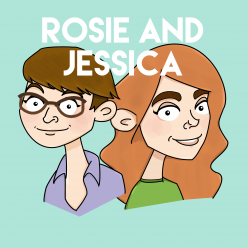 Rosie and Jessica have been to Fairport’s Cropredy Convention, where they enjoyed Edwina Hayes, Chas & Dave and Blackbeard’s Tea Party, who appear in this week’s Sit Down and Shut the Folk Up with Chicken on a Raft. Rosie’s mind is an absolute gutter after reading Peter Silverton’s Filthy English, whereas her mind was like cottage cheese reading Thomas Piketty’s Capital in the Twenty-First Century. The BFI’s Teenage Kicks season continues throughout August. You can catch up with the Great British Bake Off online. Rosie foolishly made another batch of these brownies. Jessica has finished knitting her Ribbit Hooded Cardigan and has started on these boot liners by Ruth Gallo. Wiggly Wigglers tell us how to pickle our compost. We are very grateful to Jess for bringing us #salemoftheday.